Originally referred to as ‘Jew Gold’, Kosher Kush is a clone-only Indica strain from Los Angeles, California. The genetics of Kosher Kush are mostly a mystery, though most cultivators believe that it contains OG Kush in its lineage. This interesting Indica strain that is offered by DNA Genetics comes in seed form. Some samples testing reports that its THC levels has the potential of going over 29%. This strain delivers a very strong but lazy body buzz that can knock out unseasoned users; but the Sativa-based cerebral effects it produces gives a significant boost to moods. It is known as one of the cannabis strains with the loveliest aroma and flavor. Its smell is reminiscent of rich earth and fruit. The users of this strain should apply caution with doses. The high experienced is the type typical of many heavy indica strains. 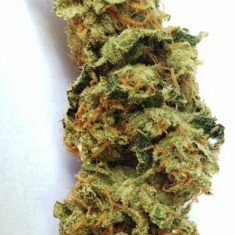 Kosher Kush delivers a heavy body stone and allows your body to go into a state of serenity, thereby easing your mind of all worries. It produces a pronounced feeling of relaxation. Its strong sedative properties lingers for a long time, and often induces sleep. One of the most common uses of Kosher Kush is in the treatment of insomnia. Many patients suffering from depression also report its effectiveness. It is also used medically to treat chronic pain, insomnia, depression, gastrointestinal disorder, loss of appetite, migraines, and PTSD. A+ quality strain, So happyyyyyyyyyyy !! thanks for the timely delivery!! perfect strain! !